Cathy Guo is a world champion choral singer from China. She has been singing professionally for 10 years, attending choir competitions in over ten countries in three continents, and winning the champion in 2012 World Choir Game (USA) and 2010 Chamber Choir Competition (Japan). 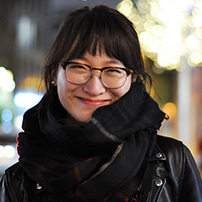 She is a talented linguist with fluent Mandarin, Cantonese, English, and Japanese, and works as a creative language tutor in Tokyo and London. Studying for a BA in Liberal Arts at Waseda University in Japan, Cathy is currently on UCL exchange with a focus on Psychology and Language Science, Developmental Psychology, and Business Psychology. She is very keen to improve art education, early childhood development, and career coaching in China and Japan, through interactions with both traditional and new media. Cathy is now based in London, and will return to Tokyo in autumn 2017.